Formula SAE: Designing to Win Using ANSYS FEA | Grupo SSC S.A. de C.V.
Finite element analysis is a crucial design tool in modern motor sport engineering, enabling the successful implementation of lighter and more efficient parts, as well as helping to expand our understanding of how complex loads react through structures. However, the complexity of the simulations combined with high computational requirements require sound knowledge of the strengths and limitations of computational software. 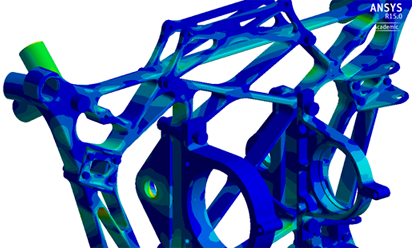 Monash Motorsport (MMS) has continually improved its FEA methodology over the years to improve designs in basic structures, composite parts and topology optimization for 3-D printed parts. In this presentation MMS will be demonstrating its use of FEA to create a competitive advantage in Formula SAE using ANSYS Static Structural, ANSYS Composite PrepPost and Genesis Topology for ANSYS Mechanical.